1. At the prophecy of Simeon: "You yourself shall be pierced with a sword - so that the thoughts of many hearts may be laid bare." (Luke 2:35). 2. At the flight into Egypt; "Get up, take the child and his mother, and flee to Egypt." (Mt 2:13). 3. Having lost the Holy Child at Jerusalem; "You see that your father and I have been searching for you in sorrow." (Luke 2:48). 5. Standing at the foot of the Cross; "Near the cross of Jesus there stood His mother." (John 19:25). 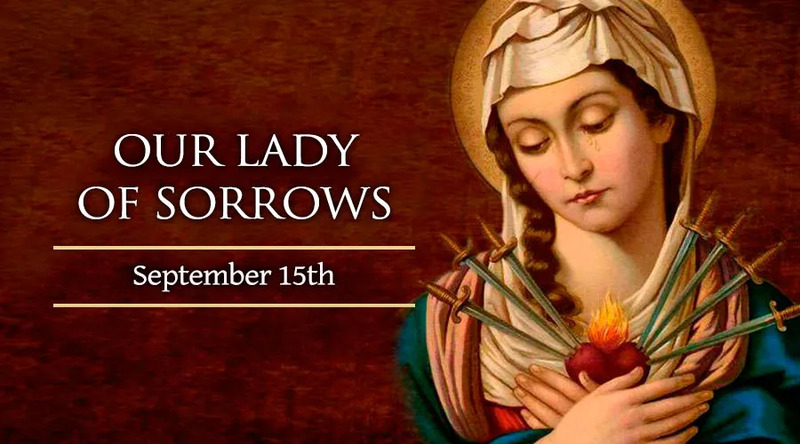 Prior to the Second Vatican Council, there were two feasts devoted to the sorrows of Mary. The first feast was insitituted in Cologne in 1413 as an expiation for the sins of the iconoclast Hussites. The second is attributed to the Servite order whose principal devotion are the Seven Sorrows. It was institued in 1668, though the devotion had been in existence since 1239 - five years after the founding of the order.